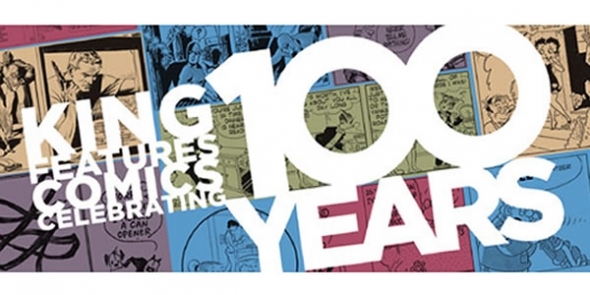 Last month, King Features celebrated a century of their comics by offering a special supplement section to newspapers. There were a few variations, and it looks as if papers ran them at various times during the back half of the month. I picked up the Plain Dealer edition which came out on Thanksgiving and Black Friday. The text portion was written by comic strip writer and historian Brian Walker, son of cartoonist Mort Walker. Not surprisingly, the piece focuses on King's specific role in comic strip history with an again not surprisingly heavy focus on William Randolph Hearst. 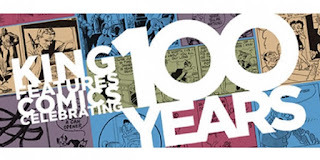 It's a solid enough piece for what it is, although people not very well versed in how comics work might express a little consternation at the absence of mentioning favorite strips like Peanuts or Calvin and Hobbes. If your local paper did not carry this, it can be read online at King's site. The other part that didn't work well, I though, was that except for the very most recent strips, they were all scanned from old newspapers. Which in some cases, particularly with the older strips, is all that is available any more, but they weren't really cleaned up for printing again. So we not only see the original mis-registrations and printing errors, but the yellowing of the old newsprint and some odd moire patterns from the original line-screens being reprinted at something other than their original size. (Presumably for space reasons, all of those old full-page strips were run at about half size.) Consequently, most of the strips looked a bit fuzzy and muddied. I know the paper quality has improved somewhat over the years, but trying to emulate the look of old newsprint on new newsprint seems like an inherently bad idea from the start. I think they would've done well to try cleaning up the art more if they wanted to showcase their old strips. It was a decent enough supplement if you happened to be getting the paper anyway. I'd have been a little annoyed if I went out of my way to get a paper specifically to see this. I'd have been pissed if I had to hunt to find a paper that carried it. (Offhand, I don't know how many/which papers may have run this.) But I happened to be in the Cleveland area visiting my parents for Thanksgiving and they already subscribe to The Plain Dealer, so it was effectively zero effort on my part. But if you missed it, just check out the online version -- the content is the same and the strip reproductions look better to boot! Haven't seen a hard copy of the supplement, only online versions. (see the title of the supplement). been to those of us old enough to remember how bad it was at times. Their choice of titles for images to display was odd to me. the most widely circulated comic strip in the world. widely known that creator Hank Ketcham only did the daily panel. was to be a showcase for Sunday comic strips only, no dailies. Works of black and white ART are nowhere to be seen. Alex Raymond's Rip Kirby, and Stan Drake's Juliet Jones. one Buz Sawyer Sunday panel that may, or may not, be by him. his Judge Parker or an example of his The Phantom. of this supplement get the IDW book King of the Comics. Salinas, among others (sadly, still no Barreto). Katzenjammer Kids, stopped running new strips in 2006. Hy Eisman produced the last new Katz. Kids strip.